On 25th November, the UK ITF held its annual National Training Day and Awards Evening. With 130 students attending the training session and over 200 in attendance at the evenings black tie event, we were all eager to get the day underway. The day kicked off with Grand Master Nicholls leading an ‘Instructor’ training session. This was a great opportunity for our senior members to come together and train as students of Taekwon-Do. With an emphasis placed on core rotation and using the natural movement of the body, we worked from Chon-Ji to Tong-Il, taking out certain movements and looking at how we could apply these principles to create more power. Tired yet invigorated, all Instructors left positive in their training, teaching and the support offered from Grand Master Nicholls and the UK ITF seniors. After a short water break, it was time for us to start the training day. As the room began to fill up with students, this was a great opportunity to meet old friends and create new friendships through a mutual love of Taekwon-Do. Following an insightful opening speech from Master Nicholls and an introduction to the Masters in the room, we were ready to begin. Looking in-depth at how to perform back piercing kick and reverse turning kick, Master Nicholls placed great emphasis on correct technique and foot position to maximise snap in the kicks. We also explored how distance from the target can impact how the technique is performed. Following on from Grand Master Nicholls, Master Horan took to the floor to explain ‘lead leg hooking kick’, how it should be performed and its application in sparring and self-Defence. Continuing the theme of the morning, we looked to explore how the kicks application could be adapted to the positioning of the opponent. Tired but eager to learn more, we took a short break before returning to the afternoon workshop sessions. Split into 4 areas led by Master Chand, Mr Buxton, Mr Brunger and Mr McAvoy, the sessions covered sparring drills, footwork, close self-defence and pad work. 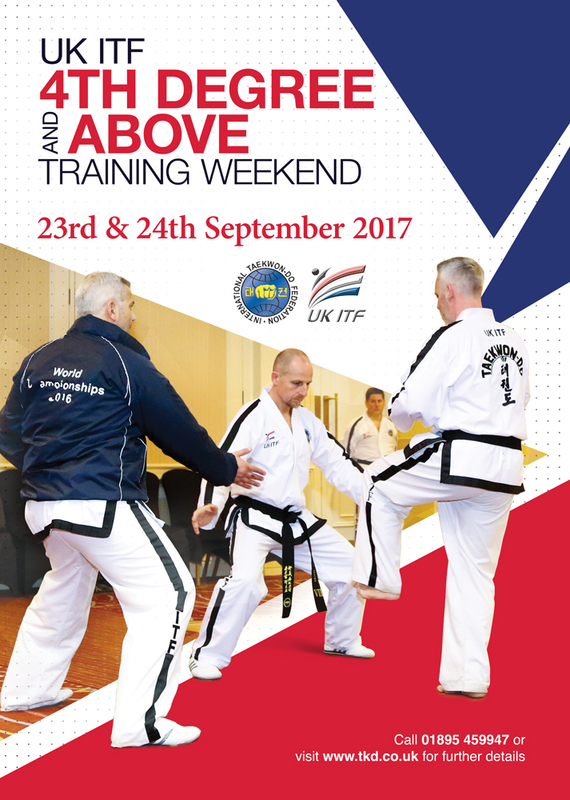 This was a great opportunity for students to learn from our senior members within the UK ITF and take back some new ideas to add to their training and sparring arsenal. With our muscles aching after a long but exciting day of training, we were lucky to receive a thorough physical and mental warm down from Master Gassor. Applying breathing techniques as a key tool for re-energising and recovering the body, all students were left relaxed and able to reflect on what had been a very insightful day of training. After a very thought-provoking closing speech from Grand Master Nicholls, we all bowed out and returned to our rooms for a good rest in preparation for the evening event. With live music playing and drinks flowing, the awards evening was now set to once again be a great celebration and reflection of the successes of the year……And we had a lot to celebrate! After sitting down for a lovely 3 course meal, Master Nicholls took to the stage to express his gratitude and thanks to all those that have helped to make 2018 such a successful year. From attending the World Championships, UK ITF Training Days and National Championships to Regional and Club events across the country, 2018 was certainly a very busy and positive year. On to the National Awards 2018……. Along with National awards, Regional presentations were made to highlight and congratulate hard working and dedicated students within the Region. This was also a great opportunity to congratulate our current World Champions, senior promotions, service awards, the unwavering loyalty and support of our Masters as well as those who went beyond the call of duty to help make this year the success it was.